Casimiro was born and raised in WNY. He has lived a lifetime of advocacy for Buffalo's Latino Community in different areas of education, health, social and economic equality. He earned a BA in American Government from University at Buffalo and also studied management from the General Motors Institute. After 34 years of dutiful service he retired from GM. He is passionate for community progress and envisions what can be accomplished in the future of Buffalo's community built on the strengths of everyone working together for the benefit of all. Casimiro is driven by social justice where you can find the core of his dedication to today's community and tomorrow's leaders. He is a catalyst for revival and progress bringing people of different faiths and races together for a common goal. Michele is the Supervisor of Curriculum in Art Education for the Buffalo City School District, serving the children of Buffalo as an art teacher, then administrator, for 20 years. Her life has been dedicated to improving and enhancing the lives of all children through appreciation and participation in the arts. Born to Puerto Rican parents and raised in Washington Heights in New York City, Michele enjoyed a very happy, vibrant, and diverse upbringing. It was her family, especially her mother, grandmother, and aunts, who instilled in her a love for arts. Michele was an art major at Fiorello H. LaGuardia High School for Music and the Art. She graduated from the School of Visual Arts with a Bachelor of Fine Arts and Rochester Institute of Technology's School of Art and Design with a Master of Science in Teaching. At the University at Buffalo's Department of Educational Leadership and Policy she graduated with a Master of Education in Educational Administration and earned advanced certification in School District Administration, Specialist in Educational Administration. Michele has exhibited her photography throughout New York where she has received several recognitions. In addition, she has received the 1st Annual Western New York Hispanic Heritage Award (2008), Woman of Distinction: National PTA Award (2010); Mayoral Hispanic Heritage Award in the Arts (2012), and the New York State Art Teacher Association Art Educator of the Year Award- Regional (2012). Tamara O. Alsace, Ph.D. is the proud daughter of Dominican parents and a native Buffalonian. As the descendant of grandparents born in Cuba, Puerto Rico, Dominican Republic, and Martinique - who all connected in Santo Domingo, she is dedicated to preserving and celebrating the aspects of Hispanic culture that unite us, while recognizing the unique qualities that define us. Dr. Alsace is a bilingual educator who has devoted her career to ensuring equitable educational opportunities for emergent bilingual learners from around the world. She retired as Director of Multilingual Education for the Buffalo Public Schools in 2015, serves on the boards of several local and statewide not-for-profits, and is Secretary of the Hispanic Heritage Council of Western New York, Inc.
Esmeralda was born in Puerto Rico and has lived in Buffalo, New York, since 2001. She received her B.S. in public communication from La Universidad de Puerto Rico, Recinto de Rio Piedras. She is the Community Engagement Coordinator for Unyts. 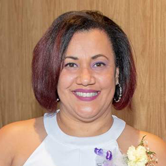 Esmeralda has a long history of activism in the community; she's been part of many organizations including the Hispanic Heritage Council of WNY, VOICE-Buffalo Inc., Alianza Latina, the Near East and Westside Task Force, and was a board member of Hispanos Unidos de Buffalo. She is also involved as an adult advisor and teacher at Holy Cross R. C. Church, where she has held positions as president and secretary of the Parish Council. Ms. Sierra was pageant coordinator of the Miss Borinquen of WNY Leadership Pageant and vice-president of the Puerto Rican Day Parade of WNY Association, Inc. In addition to her many community activities, Esmeralda is a member of various professional organizations. She was chair of the Cultural Competency Workgroup for the Health Equity Coalition for P2 Collaborative of WNY, Inc.; co-chair of the public relations workgroup for the Association of Multicultural Affairs in Transplantation; and a member of the Erie County Caregiver Coalition, the Community Health Workers Network, American Diabetes Association Diversity Committee, and the WNY Cancer Coalition. Amy, a daughter of Puerto Rican parents is a native of Buffalo. Raised and strongly rooted in the Hispanic/Latino culture, she learned to value her heritage at a young age. Amy is a graduate of Buffalo State College with a B.S. in Speech Language Pathology, an MS in Exceptional Education, as well as, an MS in School Leadership and Supervision through the State University at Buffalo. Amy has worked for the Buffalo Public Schools (BPS) as a Bilingual Speech Teacher since 1999, specifically working to educate English Language Learners with special needs. Throughout those years, she served as Chair and Co- Chair of the Bilingual and Multicultural Committees for the BPS Speech Department, and Co-Chair of the Multicultural as well as, the Translation Committee at Bilingual Center 33. In addition, she served on the SBMT at Herman Badillo Bilingual Center 76, and is currently the teacher representative for the PTO. Over the years, Amy has invested emotion, time, and energy in training and mentoring her students, facilitating their development of talents in singing, dancing, acting, and public speaking. She has collaborated with developing and sustaining partnerships between school community and parents, and school leadership teams to ensure that all students are provided equitable educational opportunities. In that regard, Amy has headed allotment and distribution of donated resources in partnership with families, community organizations and churches. She comes on board as a partner in leadership, with a desire to promote a positive cultural identity in our Hispanic/Latino youth, by encouraging them to take pride in their heritage so they can become solid contributors in our community. At an early age Aileen learned to sew from her paternal grandmother's hand, in her adulthood took classes with the acclaim Designer, Carlota Alfaro and perfecting the talent at the prestigious "Centro Moda Lisa Thon Center of Fashion and Art" located in the Business district of Muñoz Rivera Ave. in San Juan,P.R. In 2002, Aileen Design for Miss Universe, Puerto Rico, Carla Tricoli ''La Caña de Azucar" (The Sugar Cane) This was Chosen as Traditional National Costume, the outfit was a notable "hit" according to the International press coverage, that was in Panama for the pageant. Aileen, who is a very talented , in her own right, has worked with top designers , illustrators and Artist Like, Antonio Brocoli Porto, Aileen collaborate with Porto in the exhibition called: "Bomba Celebration of Sight and Sound'' in the Montclair University in New Jersey. Most of her creations evoke the female body. Sensuality and eroticism are felt right through subtle softness of small waists and LATIN RYTHMS. Her illustrations and paintings, chronicles the experiences of all, joys, tears, triumphs, defeats, and fantasies ... Feelings that are wrapped in and with the colors... of Her SENSUAL brush!!!! Born in Brooklyn, New York, Erica was raised in Utuado, Puerto Rico. She came to Buffalo, NY from Miami, Florida with self-motivation and determination, Erica began her career at Roswell Park Cancer Institute (RPCI), as a bilingual Spanish speaking associate. She currently serves as supervisor of the Roswell Park Cessation Services Department. Erica is most proud of the impact she's made in identifying and supporting the hire of bi-lingual associates to her division and team. She actively serves on Roswell's, Hispanic Employee Network Resource Group and Hispanic Heritage Planning Committee to coordinate a yearly event at RPCI celebrating National Hispanic Heritage Month. Erica's virtues of hard work, service, love and family come from her heritage, values that she shares with her sons Enrique, Juan and Johnny, who are her life's greatest motivation and accomplishments. Erica looks forward to contributing her strong values and skill set to such and outstanding organization and community. TV-news journalist Samantha Martinez was born in NYC and grew up in Orlando, Florida. She has worked across multiple platforms in the news industry, including as an on-air news anchor in New York City. During their visits to the big apple, she anchored the nightly newscasts and interviewed world leaders and controversial figures including United States President Barack Obama; United States Senator Kirsten Gillibrand; Governor of New York Andrew Cuomo; former President of Pakistan, Pervez Musharaff; and Prime Minister of Kashmir, Sultan Mehmood Chaudhry. While serving as a News Director at an international news station in New York City, Samantha led a team of producers, editors, directors, reporters and foreign correspondents to produce a nightly broadcast that aired nationally. Samantha has also reported breaking news from Florida, covering national exclusive stories like the Haitian earthquake orphans arriving in Orlando, the Casey Anthony saga, and the Tiger Woods controversy. Samantha is proud to now call Buffalo, New York her new home and is excited to be part of the Board of Directors of the Hispanic Heritage Council of Western New York, Inc., with a focus on public relations. She is committed to breaking down Latino stereotypes through awareness and understanding and celebrating contributions to every avenue of American life including socio-economic, political and cultural development. Wilda Ramos was born and raised in Yauco, Puerto Rico. She moved to Buffalo in 1986. She completed her Bachelor's Degree in Puerto Rican Studies and her Master's Degree in Education at the University at Buffalo. Wilda has worked for the Buffalo Public Schools since 1991. She worked as a clerk typist for 4 years and as a teacher after that. Currently she works as a Language Assessment Coordinator in Central Registration. Mrs. Ramos is an active member of a professional organization called New York State Association for Bilingual Education (NYSABE) for which she served as President from 1997-1998. She is dedicated in preserving our heritage and creating the awareness of its importance by showing an appreciation for it which gives a sense of belonging and pride and helps shape our lives and enriching the fabric of our community as a whole. Born in 1975 in the city considered to be the capital of Cuban sculpture, William Rios graduated from the professional fine arts school of that city, Las Tunas, in 1998. A practicing artist today, his work pleases us by offering not only hints of the multifaceted post-modern Cuban Art movement, , but also the transcendence of conceptual, politico-religious and social economical themes. His work goes beyond the ephemeral desire to report failures or problems of the modern man; and instead conveys the existential idea of being part of the heritage created by magnificent machinery in constant motion, and that reflects the proportionality of the still, vast imperial state of mind. William's creations not only delight us with his use of technical mixed-media, but by inviting us to participate in an existential puzzle and conscious auto-analysis of the concreteness of his abstract paintings. He is always taking us to the limits of reflection, using all kinds of media concepts and materials that are an inseparable part of an infinite desire to transgress time. William leads us to appreciate his personal point of view on the structure and constructive nature of American society, by absorbing it all and being an inseparable part of it through an artistic creation that becomes universal. Ricardo Saeb was born and raised in Chihuahua, Mexico, where he began his music studies and his community service work. As a classical guitarist, Ricardo has performed internationally in Latin America, the Middle East, Europe, and the US. He obtained a Doctorate in Music Performance from the University of Kentucky, and in 2018 moved to Buffalo. Ricardo believes in the importance of the arts for the betterment of society and is committed to promoting social progress through music, particularly through the guitar. John Sanabria born and raised in WNY of Spanish Ancestry, a life of community service by being a leader to many community base organizations like Puerto Rican American Community Association [PRACA], known today at Pucho Inc.
Former board member to United Way of Buffalo, Girls and Boys Club, Beechers Boys Club, City of Buffalo Youth Board. 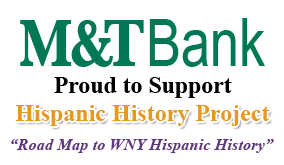 He helped establish the structure to merge Puerto Rican Chicano Committee, PRACA, to what today is Hispanics United of Buffalo. With a spirit of passion for sports and community youth; he was one of the Co Founder’s to the Roberto Clemente Baseball League, Latin American Youth Organization serving Buffalo’s inner city youth. He retired from General Motors in 2007 after 35 years of dedicated service, involved with the UAW International Labor Force during 1996 – 2006. John has been dedicated to Buffalo’s Hispanic Community all his life. He lives in North Buffalo with wife Sarah De Leon, they have two children John Jr. and Elena. Dr. Valentín was born in Brooklyn, NY and raised in Moca, Puerto Rico. She came to western New York to attend graduate school. 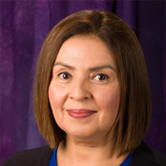 Dr. Valentín has 25+ years of experience in Bilingual Education and as a higher education administrator, teacher educator, and elementary teacher. She is an experienced educator of culturally and linguistically diverse student populations and holds New York State certifications in elementary and bilingual education. She is an experienced educator of culturally and linguistically diverse student populations (k-6) and a former elementary Bilingual Teacher in the Buffalo Public School District. Currently, she is an Associate Professor of Early Childhood/Childhood Education at Niagara University, where she teaches courses in elementary education teaching methods, special education, TESOL and multicultural education. Dr. Valentín has a Juris Doctor (J.D.) from UB Law School (1997); a Ph. D. in Elementary Education (1993) from University at Buffalo with concentrations in Bilingual Education, Second Language Acquisition and Bilingual Special Education; an Ed. M. in Elementary education/Bilingual Education (1985) from University at Buffalo and a B.A. in Sociology from the University of Puerto Rico-Mayaguez Campus. Some of her areas of interest are culturally responsive teaching, diversity issues in teacher education programs, preservice teachers' attitudes towards diversity and achievement of English language learners (ELLs). She is a member of many professional organizations and serves on several local educational and advisory boards. Maritza was born in New Jersey and by the age 4 was fluent in Spanish and English. She and her family relocated to Patillas and Peñuelas Puerto Rico, where her parents were born. Her parents, who now live with her in the heart of Buffalo's West Side, had been the first generation of her family to move to New Jersey. She is very proud of her humble upbringing in Puerto Rico, where she grew up on a farm. Over the years, Maritza has been involved in community advocacy through her involvement in several organizations such as Immigration Reform for America, the Puerto Rican Day Parade of WNY Association Inc., WNY Hispanic & Friends Civic Association Inc., and the Diversity Council of KH. One word to describe this remarkable organizer is "energy" - she is always looking for ways to help those in need. She is presently employed at Kaleida Health systems as a Bilingual Facilitated Enroller, where she works to obtain health insurance for those with no insurance or who are under-insured. Through her involvement with the Hispanic Heritage Council of Western New York Inc., Maritza is hoping to encourage understanding and knowledge of Spanish-speaking countries and to promote unity within the Hispanic community and with the larger community of Western New York. Arnold Zelman, Esq., an attorney, is of Counsel with Hiscock & Barclay, LLP which has its offices in Buffalo, & several other major cities in New York. He practices in the areas of business law, counseling, tax & estate planning & has been active in many civic organizations.